Fireworks Bundt Cake – this easy bundt cake recipe starts with a boxed cake mix. Doctor it up to make a soft and delicious bundt cake that is accidentally dairy free, thanks to my partnership with Almond Breeze almondmilk. Then tie dye it for the 4th of July! 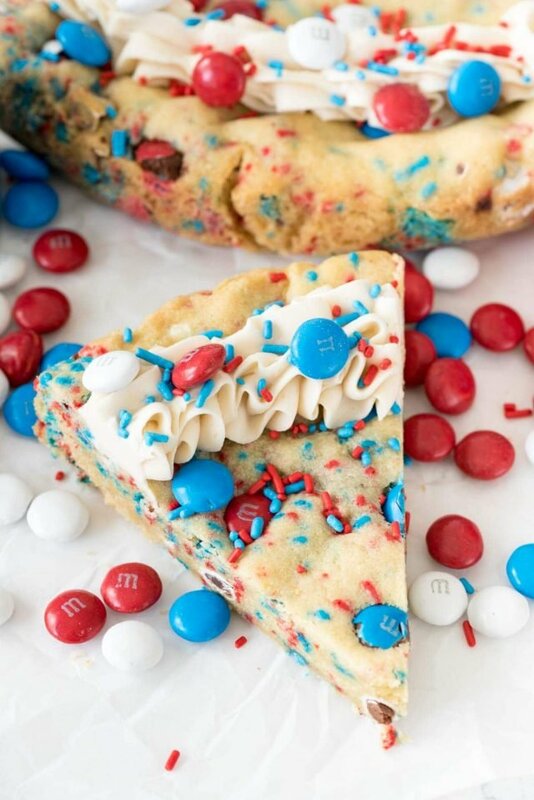 The perfect 4th of July cake recipe! I am a huge sucker for red, white, and blue food. I think that 4th of July is my favorite holiday just because of the color combination! If it was up to me I’d make Fireworks Cookies and use patriotic sprinkles all year long. One of the things I absolutely love to make (and EAT!) but hardly ever do? Bundt Cake. Also known as pound cake, this is probably my favorite kind of cake. Sure, layer cakes are nice and all but a perfect bundt cake? Now that’s magic to me. I think it’s because I’m not a huge frosting fan (gasp, I know right?!) and bundt cakes are 90% cake and only 10% frosting. I have pound cake recipes on this blog from scratch, but one of my favorite ways to make a bundt is by doctoring a cake mix. I am firmly on #TEAMCAKEMIX (someone make me a shirt!) so when I decided to make a FIREWORKS bundt cake perfect for the Fourth of July, I immediately reached for my favorite box. It’s been on my bucket list to make a swirled colorful cake like this for years. I always think, nah, they’re so overdone! But you know what? Who cares. It’s new to me, so it might just be new to you too! Plus, it’s pretty and PERFECT for Independence Day, my favorite holiday. And, I doctored up the mix just enough that no one will know it’s a mix, pinky swear. Plus, this Fireworks bundt cake is accidentally dairy-free! As you all know, I’m an Almond Breeze Almondmilk fanatic. There is always a carton open in my refrigerator (and there is usually at least one – or two – more in the garage fridge). 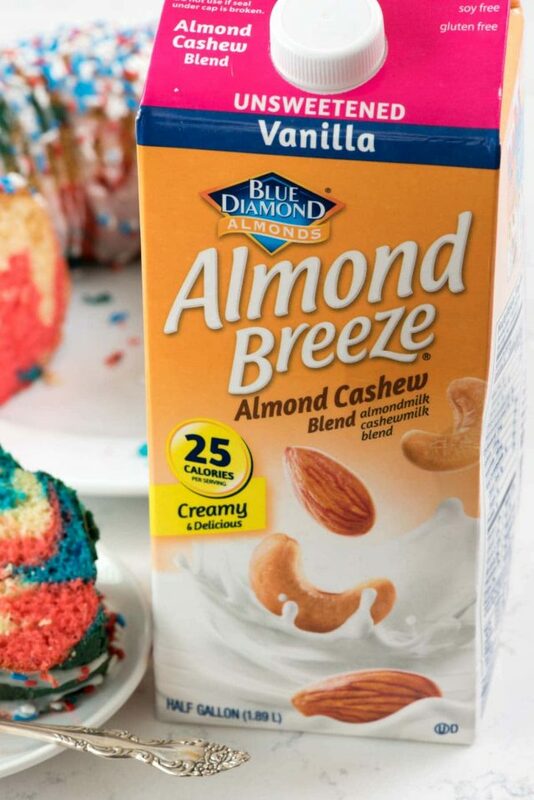 Recently, I discovered Almond Breeze Almond Cashew Blend – and it’s fantastic. Seriously, it puts all other milk to shame. I’ve tried all the Almond Breeze products and this one is my favorite. In every day life I never use regular milk; it’s always almondmilk. I eat my cereal with it and use it in everyday baking (like muffins and french toast) and I use it in cake and frozen treats too. 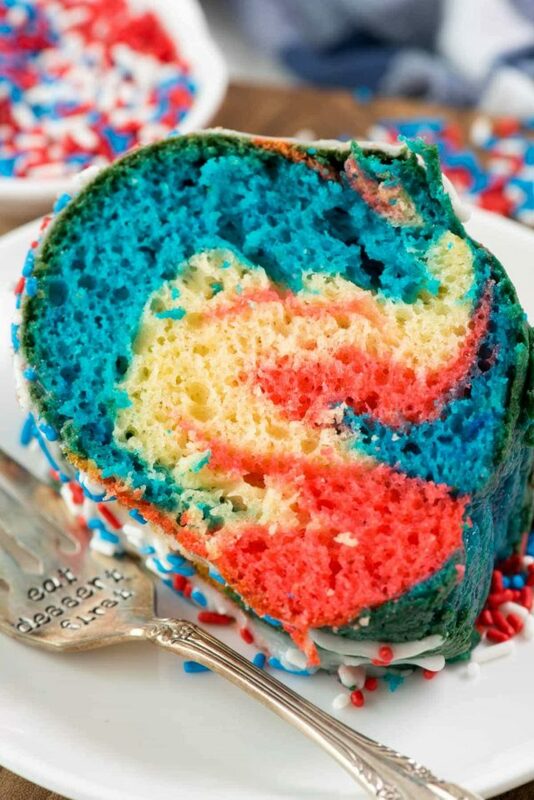 And now it’s making an appearance at my 4th of July party in a FIREWORKS Bundt Cake! Everyone who ate this Fireworks bundt cake absolutely raved about it. The smell was fantastic too – almost intoxicating. 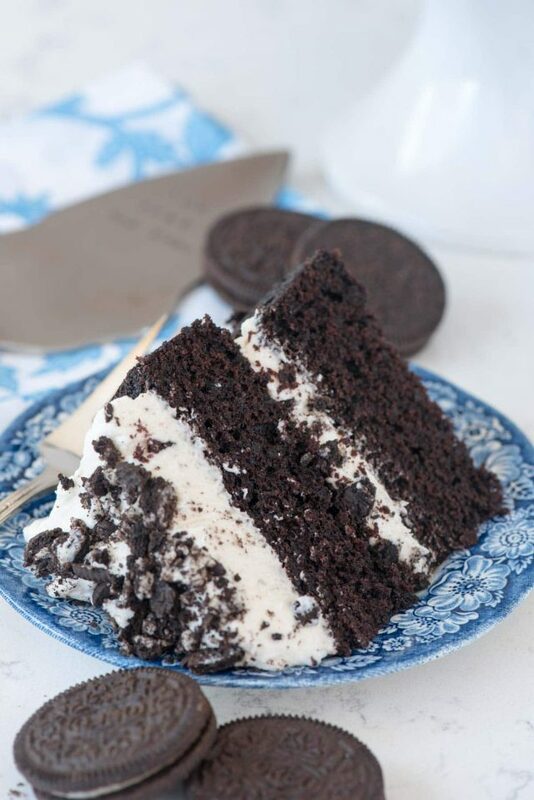 The cake stays super soft and moist from an added box of instant pudding mix. That also amps up the delicious flavor of the cake too. Instead of using the water called for to make the cake, that’s where I use the almond milk. It gives a little extra something to the texture and adds great flavor too. The swirls are really easy to make: just divide the batter into three bowls. Leave one plain, then dye one red and one blue. Simply drop spoonfuls of batter into a bundt pan, then swirl and bake. Top off the fireworks bundt cake with a simple powdered sugar glaze and TONS of sprinkles to make it even more patriotic. EVERYONE will gobble this down, I promise! Fireworks Bundt Cake - this easy bundt cake recipe starts with a cake mix. Doctor it up to make a soft and delicious bundt cake that is accidentally dairy free. Tie dye it for the 4th of July! Mix cake mix, pudding mix, eggs, almondmilk, and oil in a large bowl using a hand mixer. Beat about 1 minute, or until the mixture is combined. Separate the mixture into 3 bowls. Color one of them red, one of them blue, and leave one white. 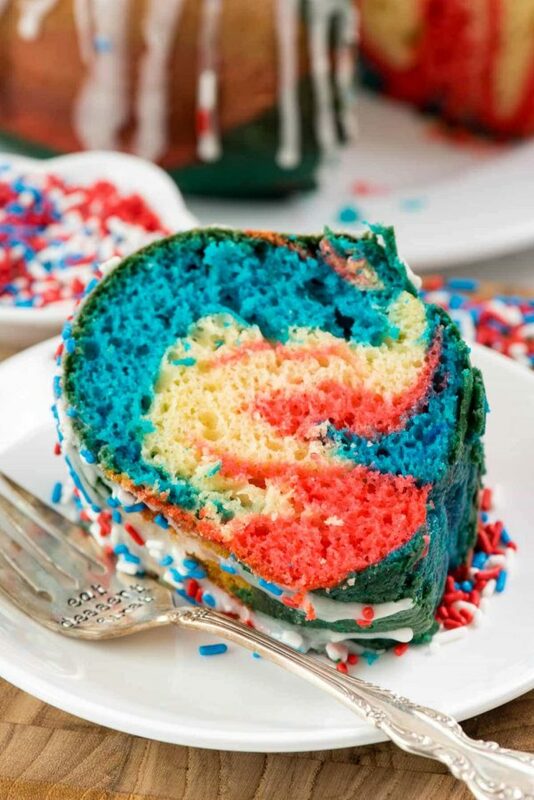 Alternate dropping colors of batter into your pan to form a red, white, and blue cake. Bake for about 35-45 minutes, or until a toothpick comes out clean. Let the cake sit sit in the pan to cool for about 15 minutes, then turn it out onto a plate to cool completely. Make the frosting by whisking the milk into the powdered sugar. Drizzle on cake and sprinkle with sprinkles. Store loosely covered at room temperature. Cake is good for up to 3 days. This post is sponsored by Almond Breeze. All opinions are 100% my own. 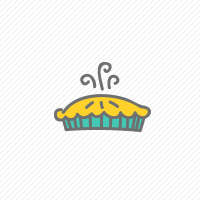 Thank you for supporting me in supporting the brands that make Crazy for Crust possible. I have never made a fireworks cake but I need to now! Being on team cake mix is awesome. Shortcuts are lifesavers and sometimes the only way a cake is going to happen on some days! Red white and blue in my MOUTH! This is awesome, D! Beautiful. OH my goodness! So cute and patriotic too. Love it! This is so much fun! 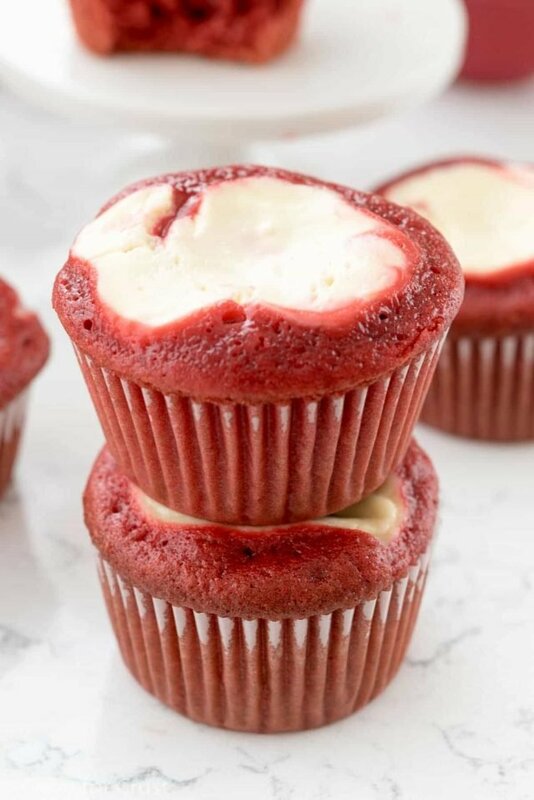 I totally want to make it for the 4th! Seriously, though, this looks so fun!